The analysis presented in my previous blog entry helped understand the post-2015 development agenda. But it was static, giving no sense of the dynamics and trends within that agenda. Those dynamics are important to all development stakeholders: “hot” topics garner funding and attention and political support, and so can gather momentum and produce real-world impact. So, using the MDGs as the comparison point, what topics are falling down, continuing on, and rising up the international development agenda? A textual analysis – for details see “From the MDGs to the Post-2015 Agenda: Analysing Changing Development Priorities” – was undertaken comparing core MDG with core post-2015 documentation. 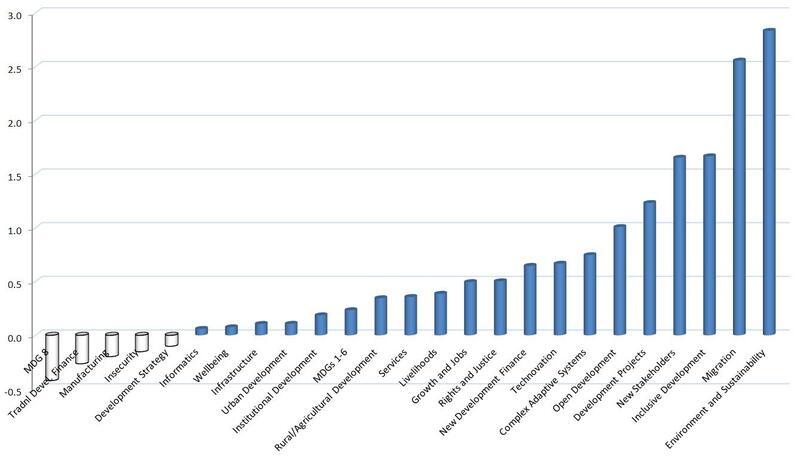 The figure below shows the results of that comparison for 25 development issues (each of which aggregates a number of separate terms). These can then be grouped into three types of issue and into four categories of change, as summarised in the table below. A blog is not the place for lengthy explanations: if you’d like to understand what each of these issues represents, then refer to the working paper. Instead, I’ll comment on the bigger picture of change. The post-2015 agenda represent a richer, more multi-faceted view of development. This reflects the breadth of consultation behind post-2015; criticisms of what the MDGs missed out; and the ongoing complexification of development. Other context also matters. In relative terms, the MDGs were written at a time of stable politics and growing economies. The post-2015 agenda is being created within a world suffering an ongoing series of economic, environmental and socio-political shocks. So some of the agenda dynamics reflects real-world change – aid is no longer as important as it was; there has been some decline in war and conflict; services have grown relative to manufacturing; migration and mobile use are rising; the private sector has an ever-larger role in developing countries. Some of the agenda trajectory reflects a mix of real-world change and the moving political spotlight: growth, jobs, inclusion and inequality are rising because of new evidence and a new economic context, but also because political insecurities have made them more salient. Climate change and sustainability also fall into this category, though the political impetus to address them remains distributed and volatile. We can try to reach into the data to find the changing narratives of development. One – which we can associate with the fastest-rising terms including sustainability, resilience and uncertainty – is that development in 2000 was about moving forwards. 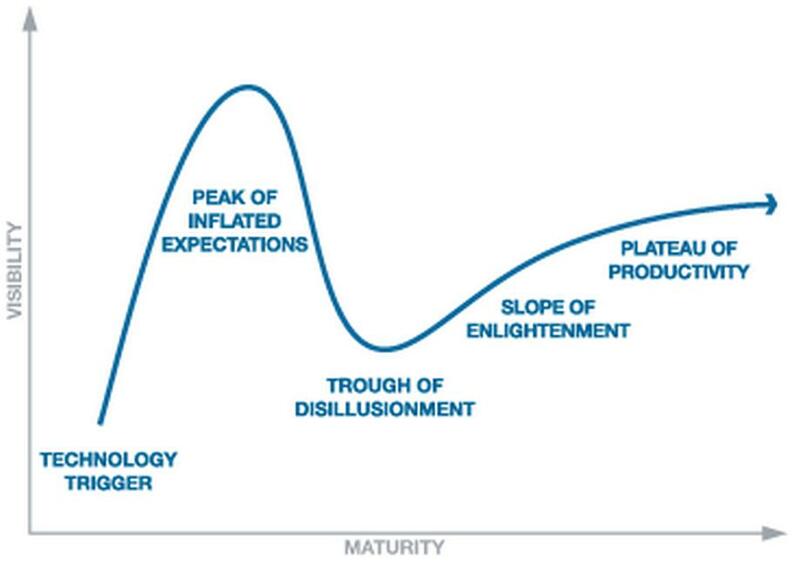 Development in 2015 will be about that, but will also be about not slipping backwards. With disability, inclusion/exclusion, partnership and stakeholders as other fastest-rising terms, we can also see a changing narrative from “development for many” to “development for all”. In turn, the events and changing priorities of the 2000s could be seen as a(nother) challenge to the neo-liberal model that has been the dominant development paradigm. Perhaps we have finally reached a point of inflection for that model in which the weight of its associated externalities give rise to some alternative. Of course claims of such a point are arguably continuous from Marx onwards, and the MDGs themselves – while not really challenging the neo-liberal model – spoke as much from the human development paradigm as any other. There is certainly an expressed desire to move from an incremental to a more transformative notion of development: that is a core leitmotif of the High-Level Panel report but it appears throughout the post-2015 discussions. In practice, the aspiration for transformation sometimes means more of the same but if there is a paradigmatic transition, it is most likely to be to a sustainable development worldview. How much political traction this will have with Western governments still likely to see themselves as fragile and emerging from recession during 2014 and 2015 remains to be seen. There is additionally the sense that opposition to neo-liberalism is somewhat divided. The post-2015 documents echo other development worldviews that could be transformational if they were the centrepiece for the future of development but which currently sit as one ingredient of the mix: inclusive development, rights-based development, perhaps even open development if it were able to deliver a well-grounded and broad narrative. Returning to a main theme, above all, the post-2015 agenda – like the MDGs – reflects the world in which it is being created. A world of growing climate change and growing inequality, of increasing global flows of capital and labour, of increasing complexity and connectivity in which a rising number of stakeholders want their voice to be heard and their views taken into account. So alongside paradigms like sustainable, inclusive and open development will need to be a worldview that accepts development as a complex adaptive system, and seeks ways to manage that emerging reality.